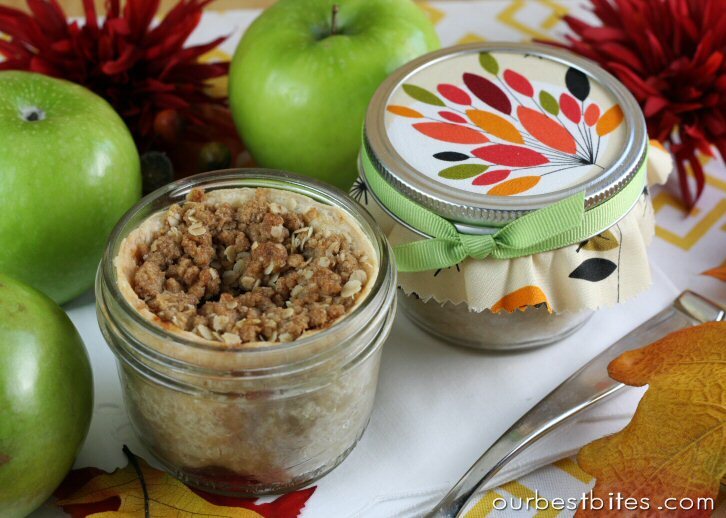 Apple Pie Filling In A Jar | Skip To My Lou. 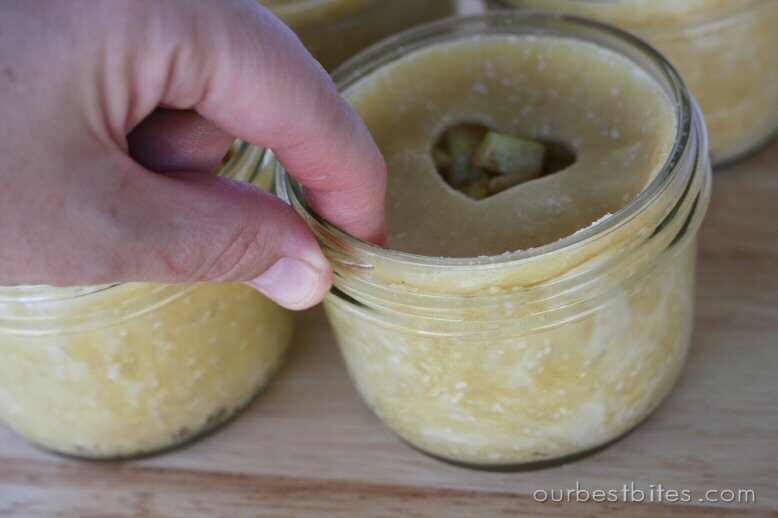 yummy apple pie filling. i use this recipe for my FUYU persimmons, too. we picked 400 lbs this year and holy cow! i had to get very creative to use them all. 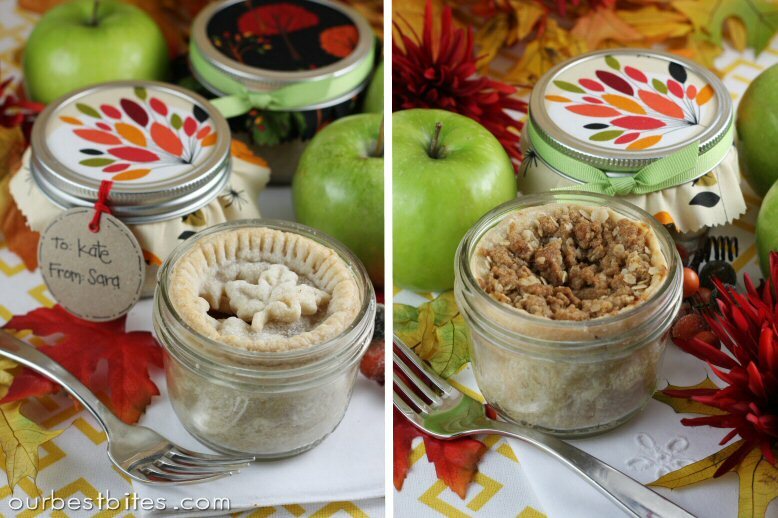 These are individual-sized pies made in little glass jars that can go straight from your freezer to your oven to your mouth. SO cute. You can make these with store-bought crust and canned filling or jazz it up with homemade like we do. 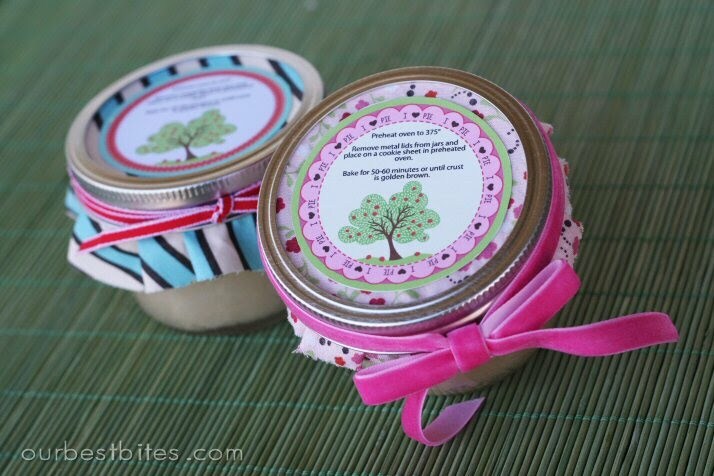 And just for added cuteness we teamed up with crafting expert Lolly for some personalized tags. These are just about the best little gift from the kitchen you could share with someone! This is the type of jar you’ll need. The first thing you’ll need is dough. 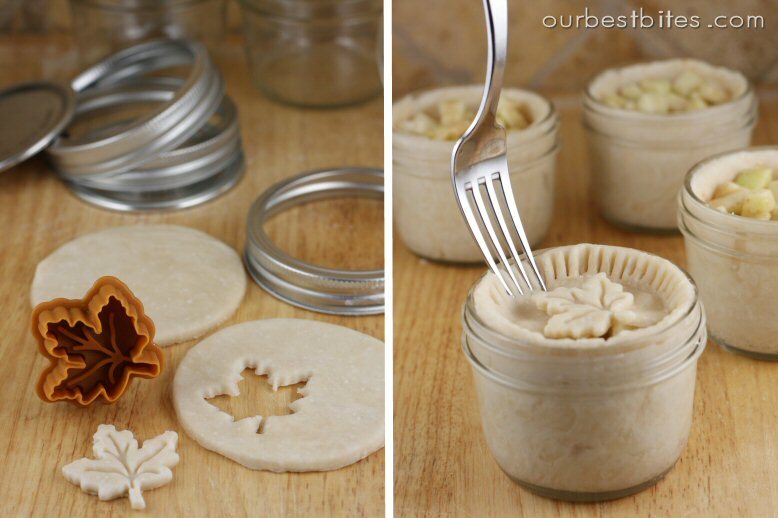 You can use any pie dough you like. 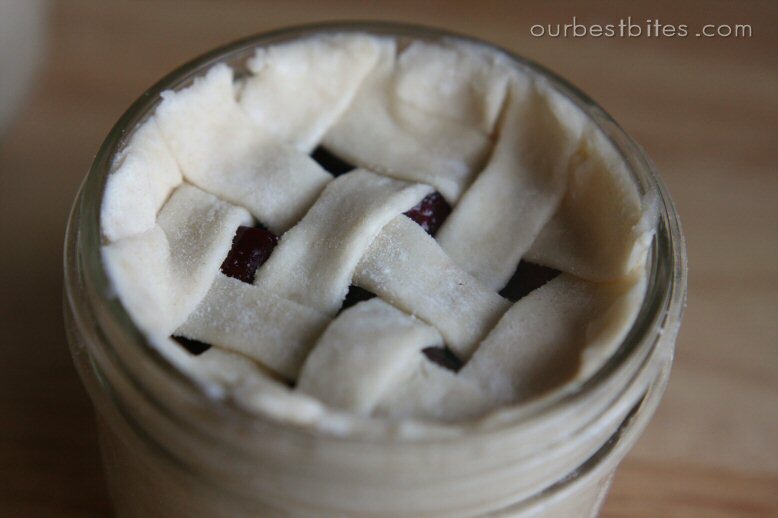 Here’s a great tutorial on making a basic crust. That particular recipe will make 4 jars. You can also use the all-butter crust from this post. Or if you’re really in a pinch, even a store bought crust will do. Roll out a small handful of dough. This is just for the tops of your pies, so eyeball about that much. 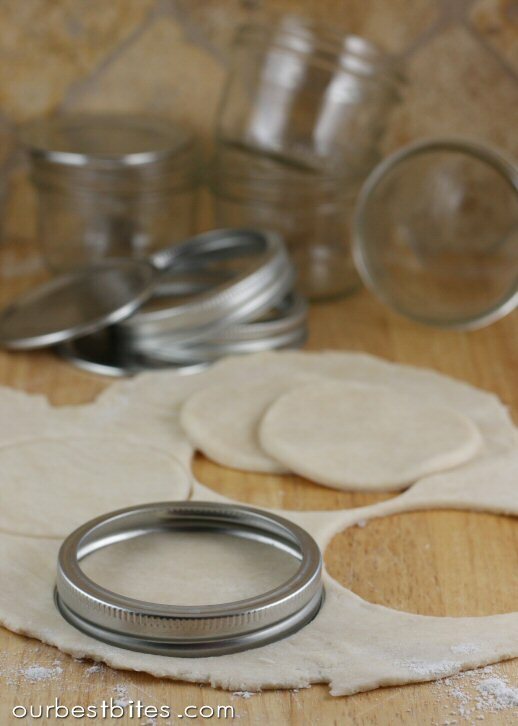 Grab the ring part of your jar and use that as your cookie cutter. Brilliant, right? Cut out the tops and set aside. 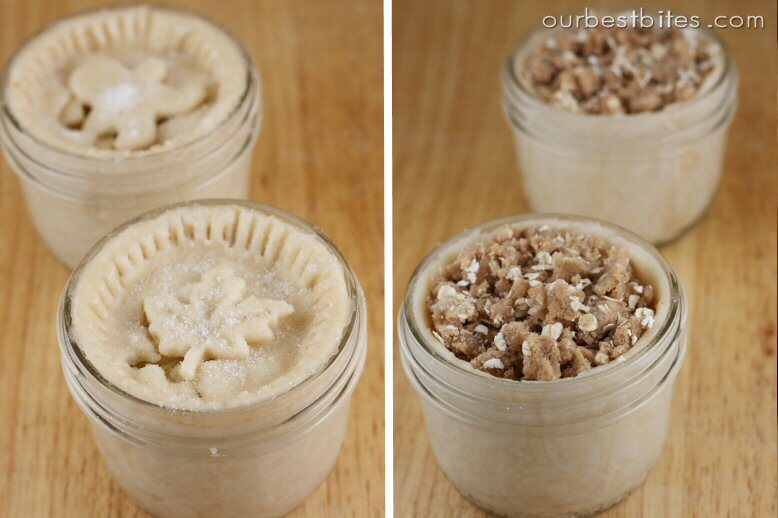 Use the rest of the dough to line the jars. (No, you do not need to grease them) The great part is that there’s no rolling required! Just take little pieces and press them in. 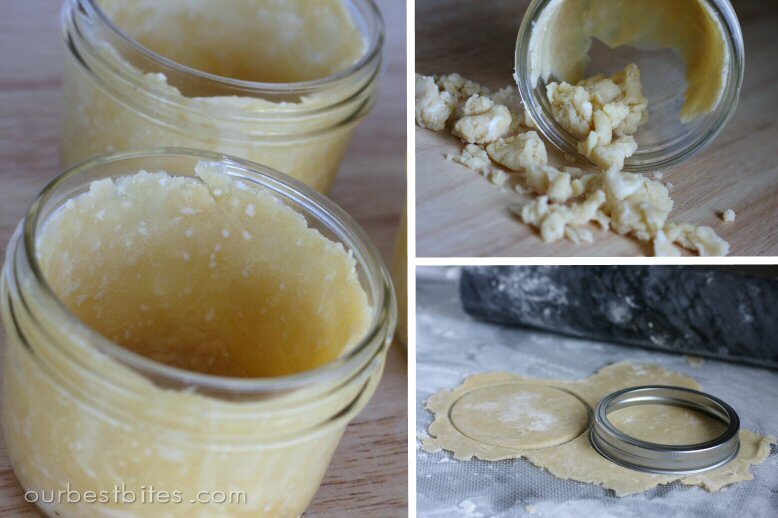 Make sure it’s pressed all the way up to the top of the jar, or pretty close to it. 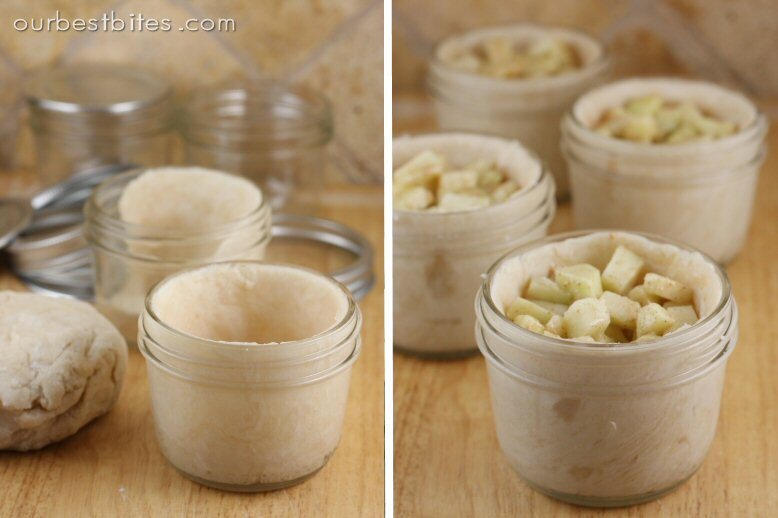 You’ll need about 1/2 C filling for each jar. 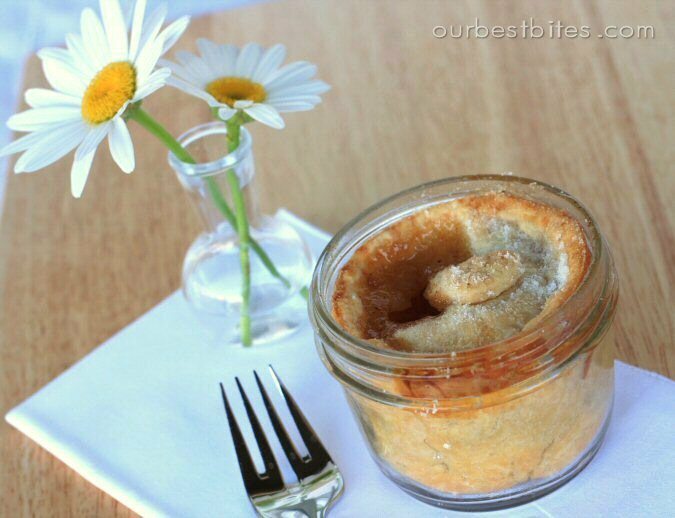 You can use any filling your little pie-craving heart desires, even (gasp) canned! You can also use the same method shown in the galette post to use any fruit you happen to have around. Play around with it and come up with something yummy! I made 2 different pies in my pictures: one, a cut-down version of Kate’s Apple Pie and one with fresh cherries and almond extract. Make sure your “lid” has a vent so steam can escape. You can use a knive to make a couple of slits or a tiny cookie cutter to make it decorative. 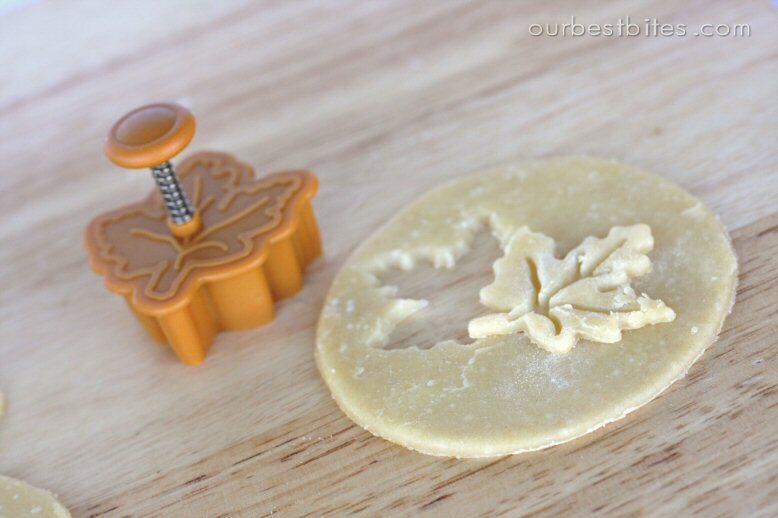 I am in LOVE with these little Autumn Leaf Pie Crust Cutters that my sister gave to me last fall. Oooh, I just saw this year’s set has an acorn in it! I might have to get that one too–how cute is that little acorn??! My little maple leaf is pretty darn cute, too. When your topper is ready, slip it onto the top of the pie. It will be large enough that the outside edge goes up the side of the dough-covered jar a bit, as show in the picture below. Then use your finger, or a fork (as seen above), to press the 2 pieces of dough together to seal. And nobody even think about mentioning the state of my fingernails. Another option is to do a crumb topping. 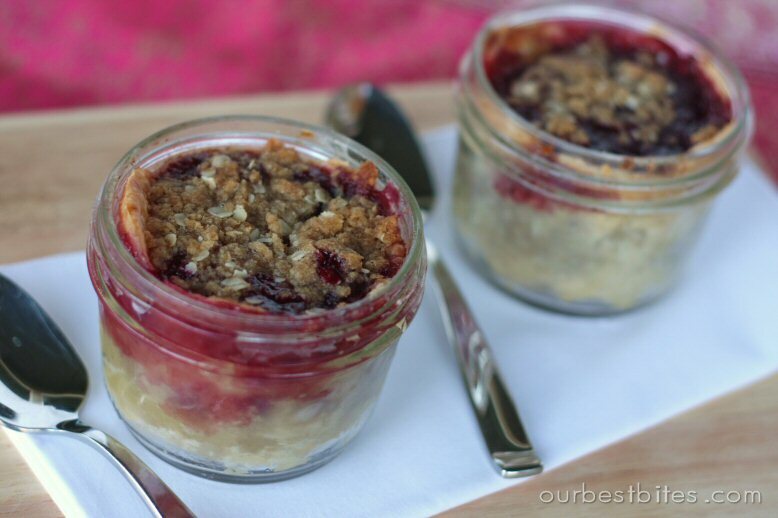 I put a basic crumb topping on my cherry pies and they were sooo yummy. Combine sugar, flour and cinnamon. Cut in butter. Add oats and stir to combine. 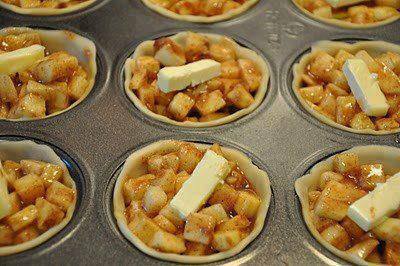 ** Optional step here that I HIGHLY reccomend: Brush pie tops with butter and sprinkle with sugar at this point. Yumminess highly instensified! Ready for this? 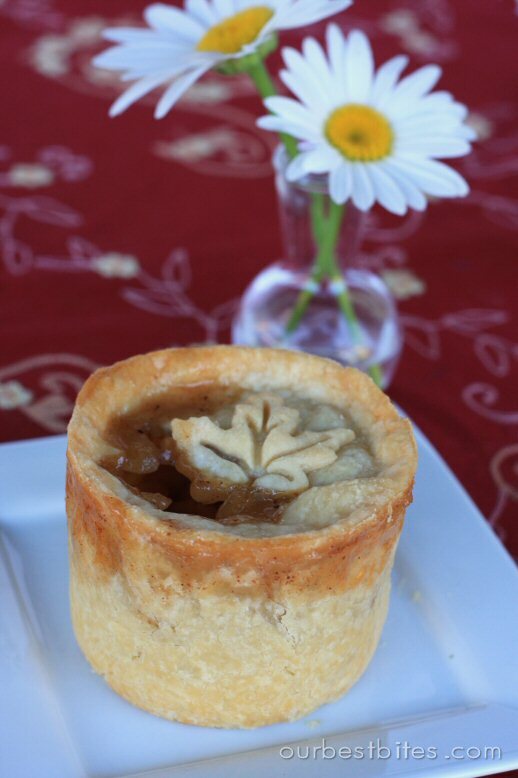 When your pies are all done and topped, place metal lids back on and seal them tight. Then pop these little cuties in the freezer. There they will stay until you find yourself having an insatiable craving for home-baked goodness. You’ll be reaching for the crumbs at the bottom of the keebler box when suddenly your eyes will light up because you remember you have THESE sitting in your freezer. 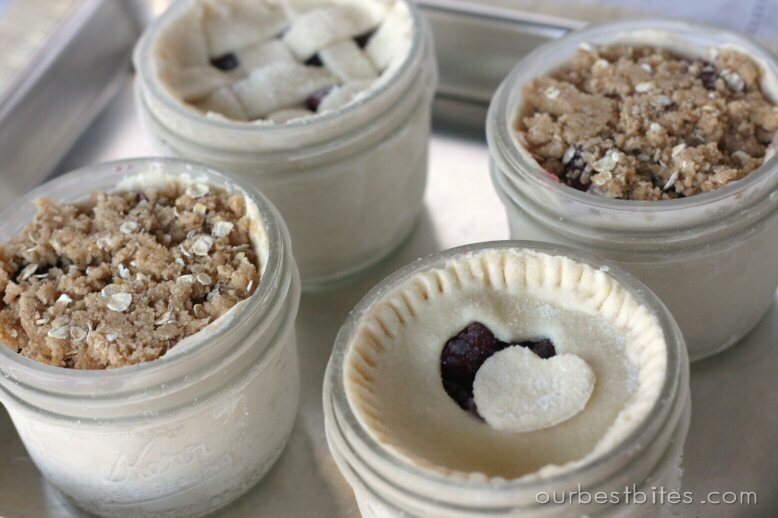 Or when you have unexpected guests in need of impressing, or a friend needing to be cheered up, or it’s Thursday…I can think of a million reasons why one should have a constant supply of fresh pie in the freezer. Now first let me say that one of the biggest concerns from everyone is about the jars breaking in the oven. 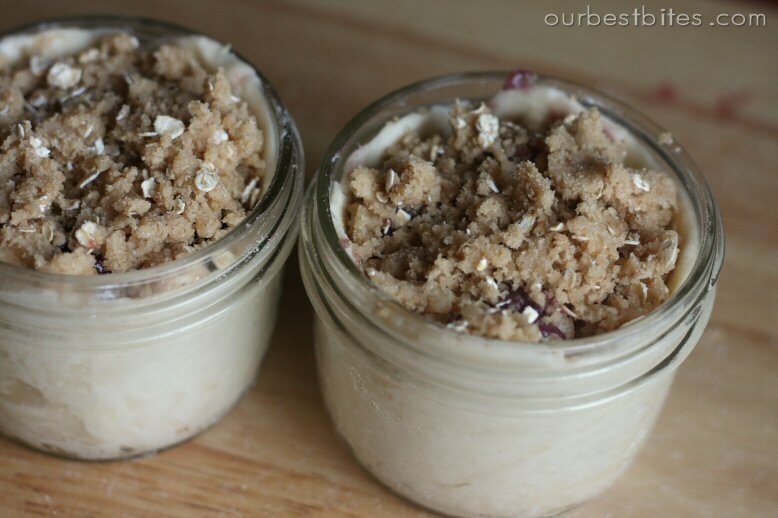 All I can say it that I’ve baked hundreds of these and never once has a jar broken. 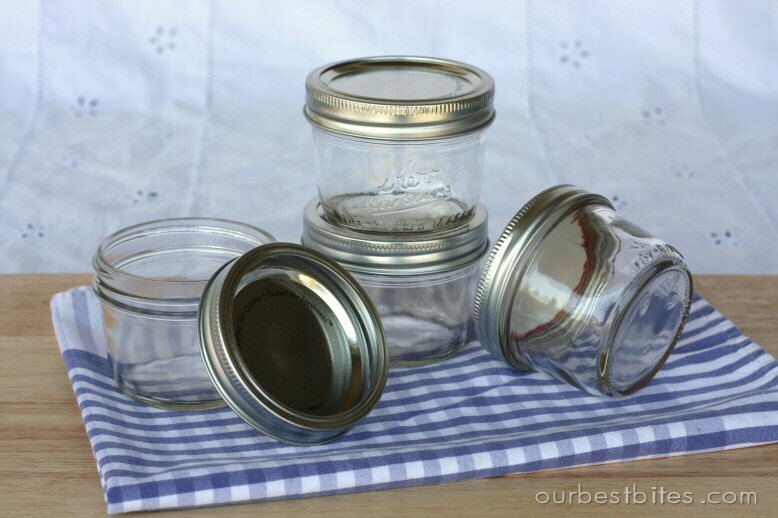 These are canning jars- they are designed to be boiled, pressure cooked, etc. So it’s different than putting any ol’ piece of glass in the oven. They bake just fine!But if you’re freaking out then my advice would be this: remove lids from jars and place jars on a baking sheet. Place baking sheet in a COLD oven. Then turn the oven to 375. That will give the jars a chance to warm up slowly as the oven preheats. If you’re really worried you can always let them sit at room temp for a bit first before putting them in a cold oven. Bake for about 50-60 minutes, or until the tops are golden brown and the middles are bubbly. If you’re baking them fresh and not frozen they take about 45 minutes. And if you have oozing cherry filling, that might be the only option! Or you can skip the freezing all together and just bake them up for gifts. Lolly is the brain behind Lollychops. Some of you may remember last year when she designed these cute cute Christmas tags for us to put on our goodies. So of course, I instantly thought of her when I realized that I could not sleep at night knowing these mini-pies could be better dressed. They needed just a touch of Lolly. And she delivered like always with these adorable tags! All of the directions are right on the tag and you can write a little To/From on it. Plus in true Lolly fashion there’s like, a million different versions to go with any flavor you could possibly imagine. 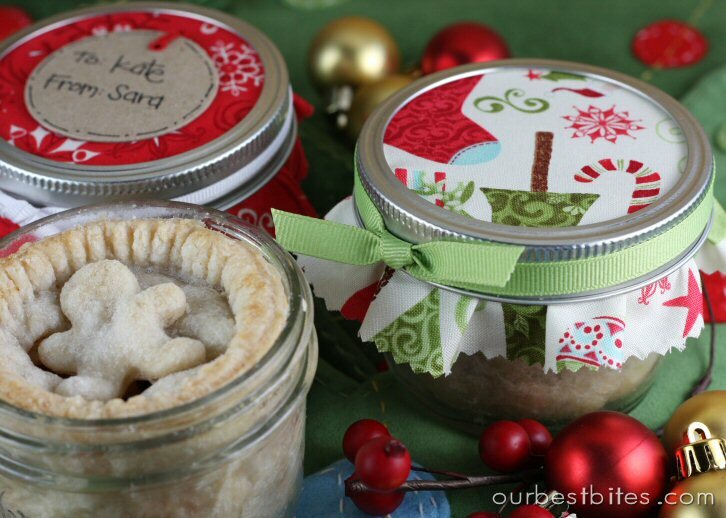 These little pies are perrrrrrfect for giving. So once you have these cuties made up, download Lolly’s tag set, and get your cute on. 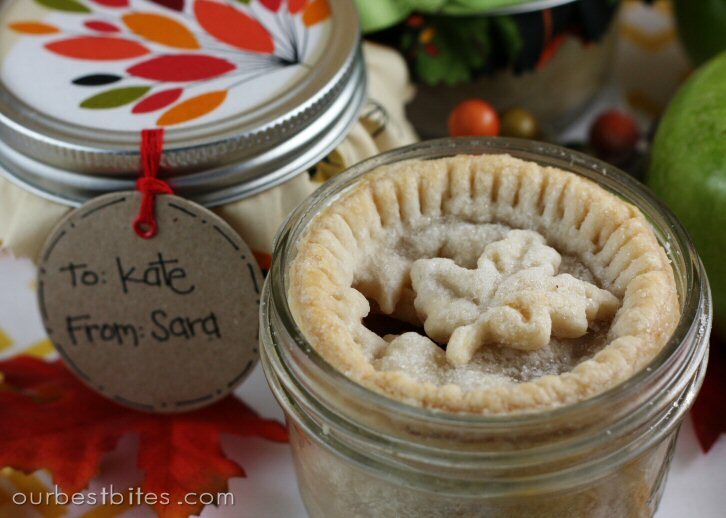 People will think you are amazing because not only did you come up with the brilliant idea to make a mini pie in a jar, you also made an adorable personalized tag. Talk about moving up a notch on the popularity ladder. –> CLICK HERE <– to head over to the Lollychops blog and get all of the instructions and details on downloading and using the tag sets. And here is a direct link to the tags. 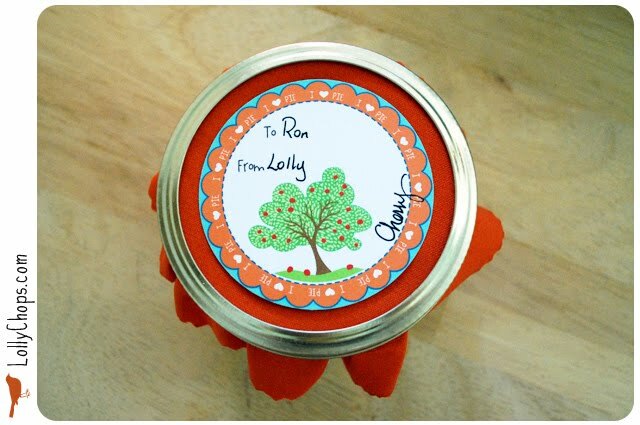 Edit: Lolly has just added this adorable TURKEY pie tag!! Click HERE to get it! A big thanks to my girl Lolly for playing along with pie this week! All of the rest of you- get baking and have a great week! SENDING OVERSEAS: One of the most common questions we get is about sending these overseas. I have not personally sent these so I cannot give advice from personal experience, however many people have left feedback. 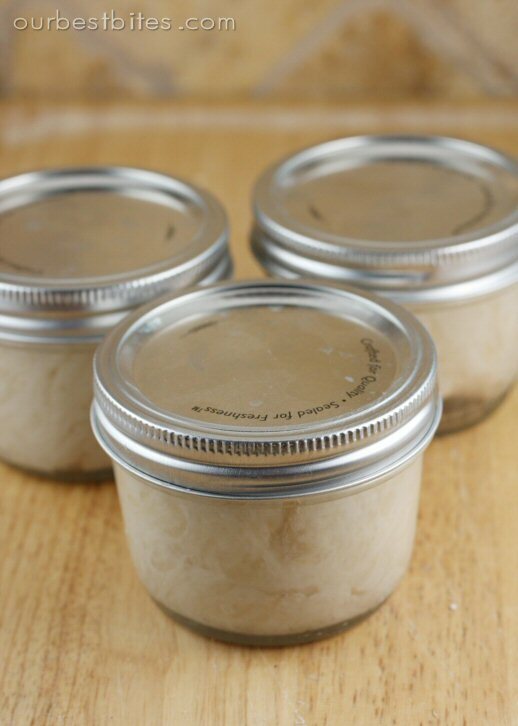 People have noted that putting the lids on the jars when the are still hot out of the oven and then letting them cool to room temperature helps “seals” them and keep them fresher longer. 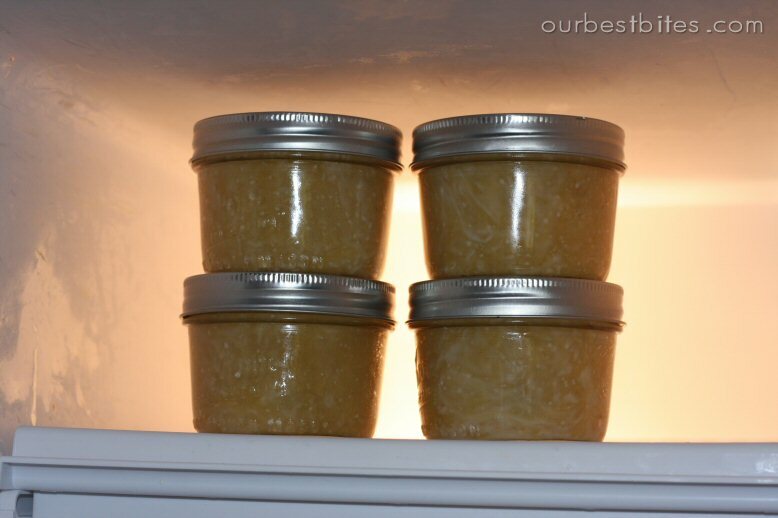 Note that the canning jars are purely for appearance and these are not shelf stable. I cannot tell you how long they will stay fresh, as environmental conditions (heat of travel vehicles etc) would all affect the pies. Generally when shipping to soldiers overseas items need to stay fresh for 1-3 weeks. Many people have shipped the pies with success, but that’s all we can offer in terms of advice.